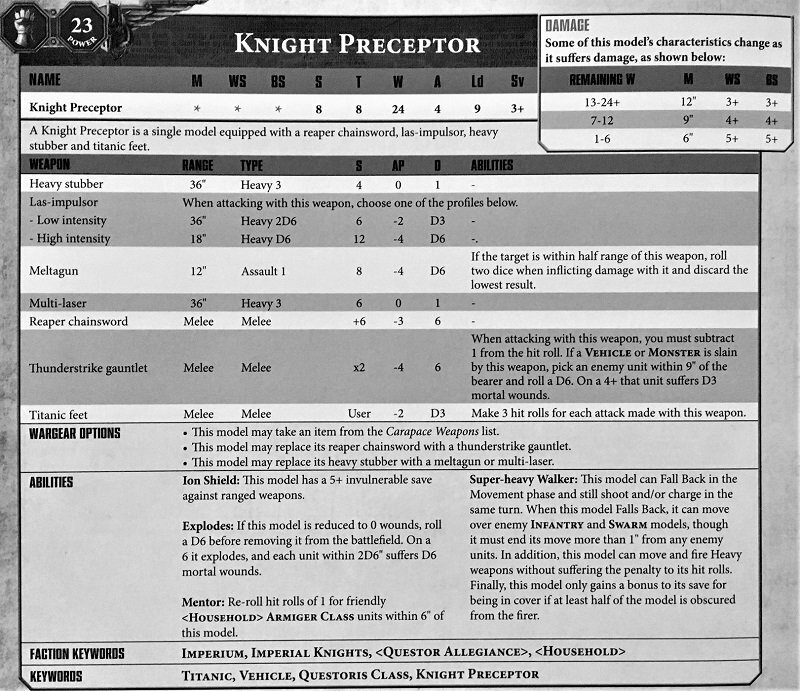 The Knight Preceptor Kit is finally out for Pre-Order this weekend. Has it been worth the wait? Let’s take a quick refresher on the rules to find out! The Knight Preceptor made a splash when the Knight Codex came out months ago. Folks were genuinely excited at the prospect of another new type of Knight with the new armament options. 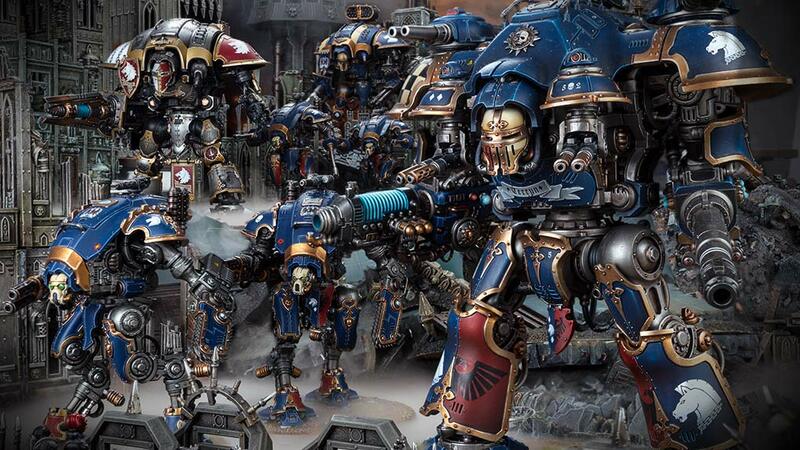 However, after the release of the codex we got the new Dominus-Class kits but, Knight Preceptor was no where to be found. Why the delay? We may never know – but it’s out this weekend! So… what does this thing DO, again? The Knight Preceptor is a pretty typical Knight. However, it has access to the new Las-impulsor. This weapon has two different fire modes that give it a chance to threaten just about anything on the tabletop. While the range does seem a little limited, remember that the Knight has quite a bit of movement and a VERY large base. There are very few places to hide when the Knight starts to move in a particular direction. Plus it can move over enemy Infantry and Swarm models thanks to the Super-heavy Walker rules. preventing this Knight from getting a good shot isn’t impossible, but it IS difficult. Whatever it decides to target, that unit will need to brace for losses. The Knight Preceptor also has a unique rule that allows it to buff the Armiger Class units. Re-rolling hit rolls of 1s for the Armigers nearby can be insanely effective. Depending on which version of the Armigers you’re using will determine the best positioning for them around the Preceptor. Warglavies for example make excellent blockers that can be positioned in front of the Perceptor. Their shorter range Thermal Spears are pretty devastating and they are pretty deadly in close-combat as well. 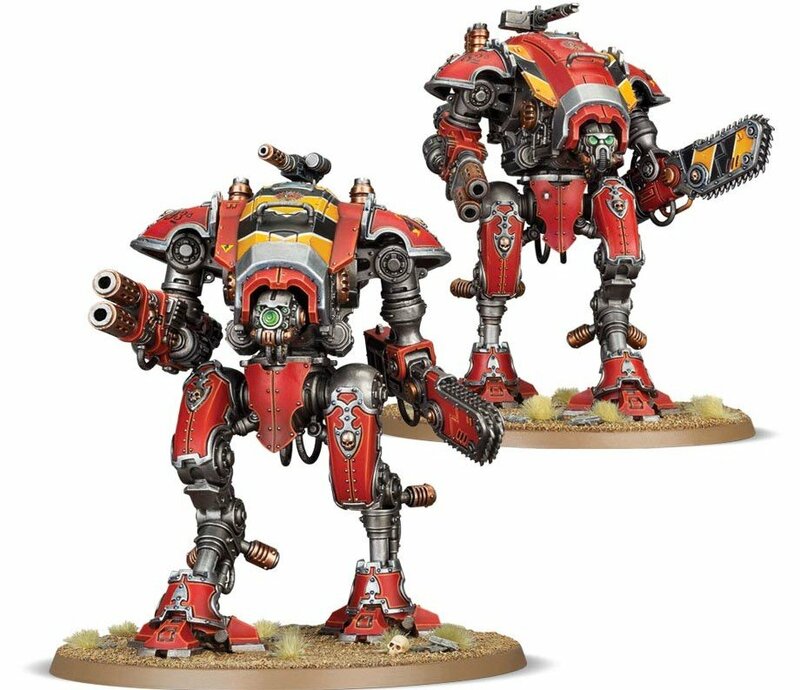 A pair of them can form an effective wall that will break most things that try to bash-up against it – or at least tie up the target so the Knight Preceptor can do it’s thing. Helverins on the other hand actually benefit from staying behind the Preceptor. Their long range firepower is super effective once you toss in a re-roll for all their 1s. Have the Preceptor take the brunt of enemy fire and/or charges while your Armigers pummel them with their Autocannons. 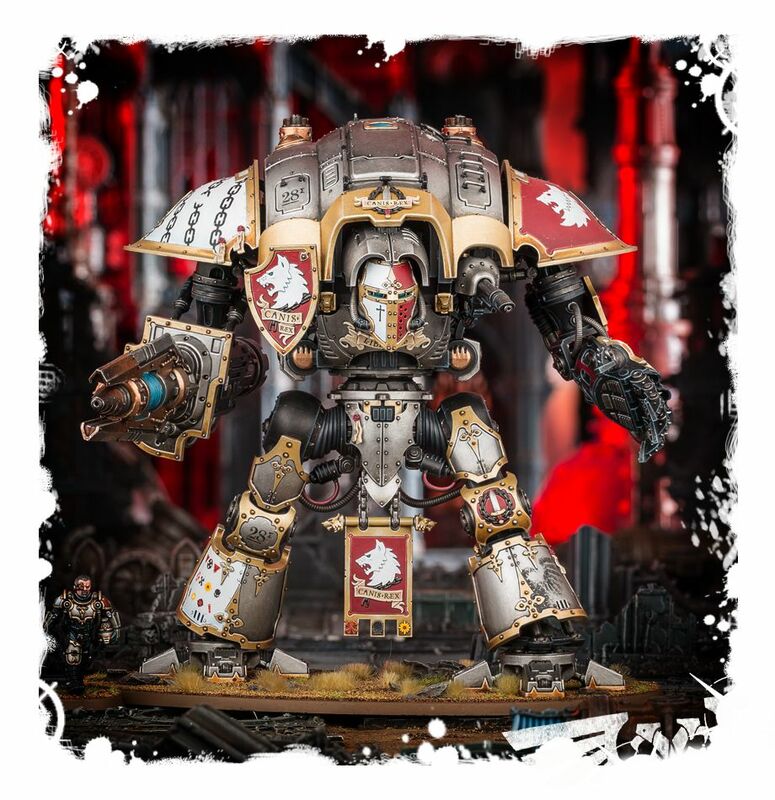 The Preceptor makes an interesting addition to any Knight household and if you have Armigers it’s worth considering picking one up for the benefits. That would make for one potent super-heavy detachment! Are you excited about the Preceptor? I can already hear the Armigers cheering for it’s arrival.